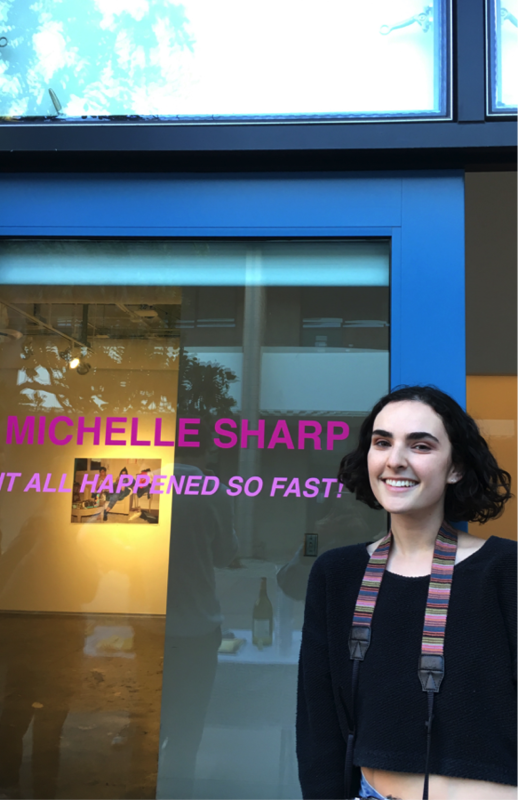 “It All Happened So Fast!” is one of the multiple Glass Box Gallery exhibits Michelle Sharp has premiered. This one in particular was featured in late February, 2018. Michelle Sharp, a double major in Art and Mathematics who graduated this spring, decided to branch out from her background in math to expand her repertoire in the arts. Sharp is among a growing number of UCSB students who are combining STEM majors with those in the Humanities and Fine Arts. Sharp exhibited much of her photography in the Glass Box Galleries, which feature student and faculty creative work on campus. And she created an animated short, “Agnus’ Front Lawn,” for one of her film production classes, which is a comedy about an old woman trying to win the neighborhood’s lawn competition. After exploring the ins and outs of various creative departments, Sharp is finding her passion in animation. She finds it is easy to get jobs in art-related fields, saying it takes hard work but if you are dedicated it isn’t much different than finding jobs in STEM related fields. In a recent interview, Sharp explained how she was able to leave her comfort zone with the help of art and film classes offered on campus. And she discussed how studying both mathematics and art has helped her find her passion in the world of animation. Q. Tell me about how you got involved in animation being an art major? A. That was actually completely from left field. One of my dad’s family friends used to work at Pixar, and he was telling me that in animation, they love to see people with art backgrounds—but also tech backgrounds. It just seems to work the best. Michelle sets up for one of her Glass Box Galleries “It All Happened So Fast!”. The [UCSB] art advisor said that there are some animation classes within the film department. I pretty much forced my way into the class and that is where it all started. There was an animation seminar class that was offered where the professor would invite alumni that worked in various studios. Someone from Pixar and Disney came to talk to our class. Q. You mentioned you premiered an animated short for your film production class in spring, 2018 at the Pollock Theater here on campus. Tell me more about the process of producing an animated short alongside all your other studies? A. There is a class in the film department called Film Production. In the fall you pitch an idea in the Pollock Theater in front of judges, professors, and students. It was terrifying. Our pitch didn’t get picked. However, two teachers in the class really liked it and asked us if we wanted to make it anyways. At some point, we switched our original idea to the film we premiered, “Agnus’ Front Lawn.” It’s super goofy and funny and we wanted to be over the top with it. We started animating at the beginning of winter quarter and it took us the entire quarter to make the actual film. It was truly rewarding to see our short be premiered in the theater in front of so many people. Q. So it sounds as if you have had some serious real world experience here. Did this whole process make you feel like you want to get into animation in the future? A. I definitely had known that the whole process is very labor intensive. It gave me an idea, more specifically, of what I wanted to focus on. In animation, the jobs are so specific. I also knew that I mainly wanted to work with 3D. I am learning how to use the 3D software, the basics of all the 3D animation, 3D modeling, and rigging. So that is the direction I would rather go in, which is usually also where visual effects go. Q. Do you feel that UCSB has offered you the chance to build up your skills enough for the real world? A. I was actually surprised at how many opportunities we have here. Because I have the background of math, I have been looking into more “tech” related careers like visual effects and virtual realities. I also really love all the skills that I have learned such as directing a crew, learning how to work in a really big group, and coordinating everyone. Especially for the arts, everything is here. You just have to look for it and dig around to find all these tools that are available. If I had stayed in the art department completely, I probably wouldn’t have found the animation department here. I have met a lot of really amazing friends through other students who also want to do animation. It is such a collaborative space because everyone has their own kind of edge they bring to the table. Adar Levy is a third-year student at UC Santa Barbara, majoring in Sociology. 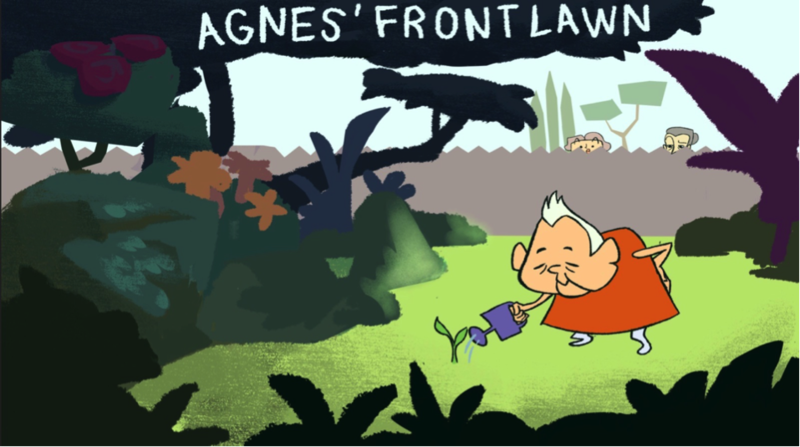 “Agnus’ Front Lawn,” the animated short Michelle premiered last winter in the Pollock Theater.